After nearly a week in Botswana we drove north and crossed the border into Zambia, where we parked the overland truck for a four-day hiatus in Livingstone. Allison and I originally intended to end our tour in Livingstone but we were enjoying the company of our group as well as the convenience of overlanding. The tour gave us a break from seemingly endless planning, the truck was an easy alternative to otherwise difficult transport in Africa, and food and camping was much cheaper than if we’d been traveling solo. 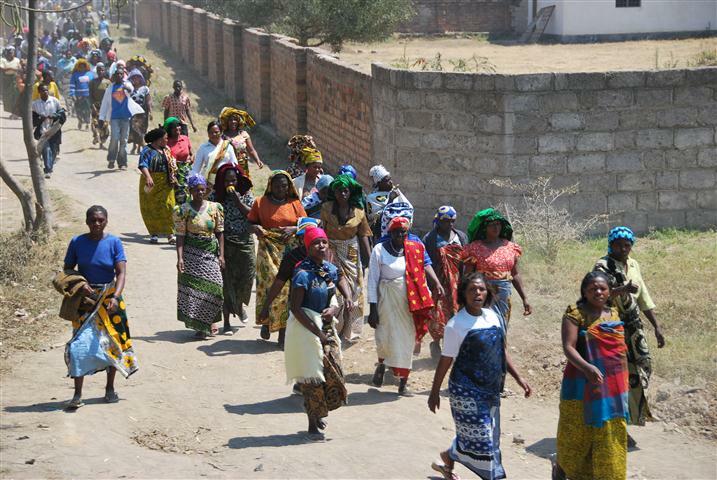 We decided to extend our trip, and continued northeast into Malawi, then into Tanzania. On September 2nd, 41 days after leaving Cape Town, we arrived in Nairobi, Kenya. Most interesting during the second half of the tour might have been the contrast among the countries. South Africa, Namibia, and Botswana, visited during the first half of the tour, shared a similar feel. The highways were well maintained and the cities were clean and filled with modern buildings, houses, and supermarkets stocked full of fresh and prepared foods. We crossed borders quickly and without hassle. We noticed a marked change as we approached Zambia. 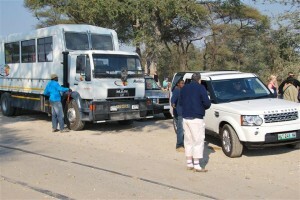 Trucks lined up for miles waiting to board the ferry across the Zambezi River. We’d arrived very early and as a passenger vehicle we enjoyed priority, but we still waited for over three hours as other vehicles including shiny SUVs and another overland truck were inexplicably waved around us and onto the ferry. 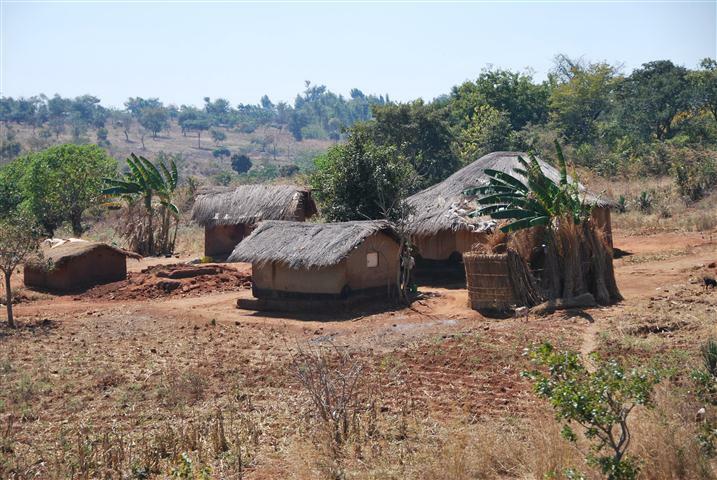 Once we finally crossed into Zambia we found a dustier place with dirt roads, smaller buildings and mud houses covered with thatched roofs. In particular contrast with sparsely populated Namibia, the streets teemed with colorfully dressed people. Women carried packages on their heads and babies on their backs. Crossing from Malawi to Tanzania was another interesting transition. Tanzania seemed wealthier; we saw more mud houses but many of them had metal roofs. We also started to see large scale agriculture for the first time since South Africa, with fields of wheat, corn, and tea stretching to the horizon. One constant throughout all of our travels is the perceived magnificence of waterfalls. Waterfalls are considered to be the pinnacle of natural beauty, and gazing upon a waterfall is a mandatory component of travel. Invariably disappointing, we’ve now learned to avoid the waterfall excursion, although we occasionally let down our guard. In Turkey we were somehow persuaded to hike to a waterfall that wasn’t even flowing. However, when our overland tour took us to Livingstone, Zambia, we made an exception to the waterfall rule and visited Victoria Falls. Victoria Falls is on the Zambezi River between Zambia and Zimbabwe, and by some measures is considered to be the largest waterfall in the world. It’s difficult to comprehend its sheer size and magnificence. During our hour of exploration we saw less than half of the crest and never really saw the foot of the falls, which was largely obscured by a constant spray. 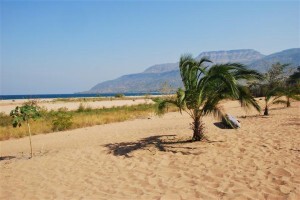 Our visit to Malawi focused on Lake Malawi, the large freshwater lake that covers over twenty percent of the country. We camped four nights alongside the lake, which with its sandy palm-lined shores, dark blue water and crashing waves is more reminiscent of an ocean than a lake. Lake Malawi was a welcome break from the road, and while there we relaxed on the beach, walked to a nearby village, and went diving. By far our strangest experience in Malawi was shopping at a craft market outside of the campground. 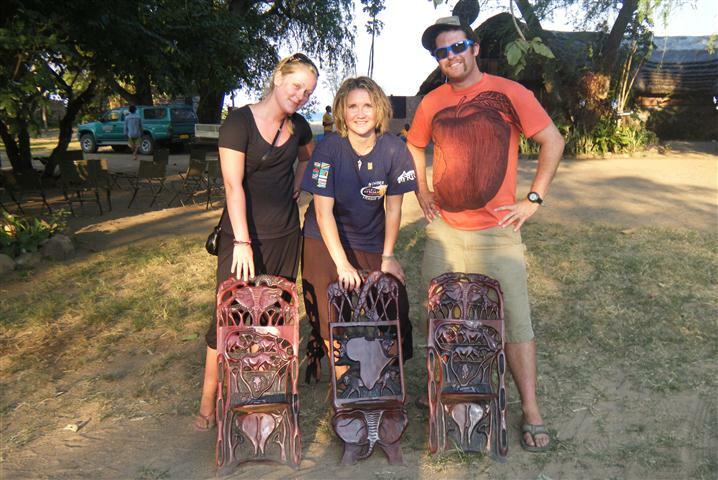 Malawi is known for wood carvings, particularly two-piece wooden chairs. Our tour guides mentioned that the merchants will sometimes accept trades in lieu of cash. We didn’t realize the full potential of this barter system until Annah, aka “Piggy”, traded her mobile phone for three chairs. We subsequently traded our phone, a five-year-old model that wouldn’t even work in Africa and that we’d intended to throw away, for one chair. Following these bizarre but apparently mutually beneficial transactions there was a flurry of activity as our fellow overlanders scoured the truck for random objects that could be exchanged for more chairs as well as wooden bowls, cups, and animal figurines. Two excruciatingly long days of driving and two hours on a ferry brought us to Zanzibar, an island off the coast of Tanzania known historically for spice production and more recently for its white sand beaches. We spent our first two nights enjoying the beach on the northern tip of the island, and a third night further south in historic Stone Town. We toured a spice plantation and learned about the cultivation of spices including cinnamon, cloves, and vanilla. From Zanzibar another long day of driving brought us to Serengeti National Park. 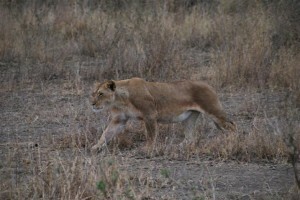 We spotted many of the same animals we’d seen in Etosha and Chobe, including a few lions. However, we missed the massive population of wildebeest that continually migrate through the Serengeti National Park in Tanzania and into the Masai Mara in Kenya, following the rains and green grasses. They probably headed into Kenya in June and July, and were long gone from the Serengeti by the time we visited in late August. 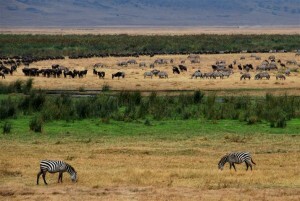 We found better game viewing in the Ngorongoro Crater, a 100 square mile volcanic caldera home to about 25,000 animals. There are several water sources in the crater and, unlike in the Serengeti, most of the animals are year-round residents. 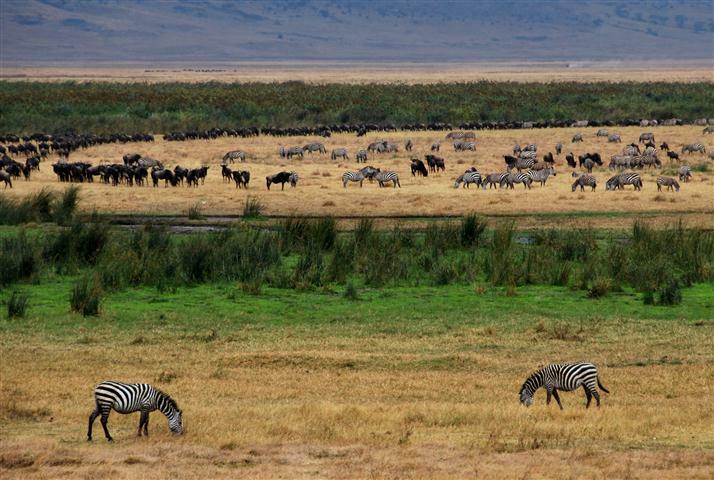 The crater presented stunning panoramas of pink flamingos strolling in pristine waters and thousands of wildebeest and zebra grazing in the green and gold grass. Our last day on tour started like so many before it, as we woke before dawn, packed up our tents, and ate a quick breakfast. After we left Tanzania and crossed into Kenya we traveled over some of the roughest and dustiest roads of the entire tour. The sun was setting as we entered Nairobi, and after nearly two hours in gridlock we finally reached the city center. After the exhausting day of driving we said anticlimactic goodbyes and went our separate ways: some to the airport, others to a hostel outside the city, and a few of us to a hotel nearby. We were sad to leave the truck and our traveling companions behind but were also excited for the next leg our our travels, when we’d finally venture out alone again. From Windhoek, Namibia we pointed our overland truck east and drove 500 kilometers into Botswana, a landlocked country in the middle of southern Africa. Since gaining its independence from Britain in 1966 Botswana has emerged as one of Africa’s development success stories. Botswana is considered one of the least corrupt countries in Africa, with a growing economy based on mining and tourism. 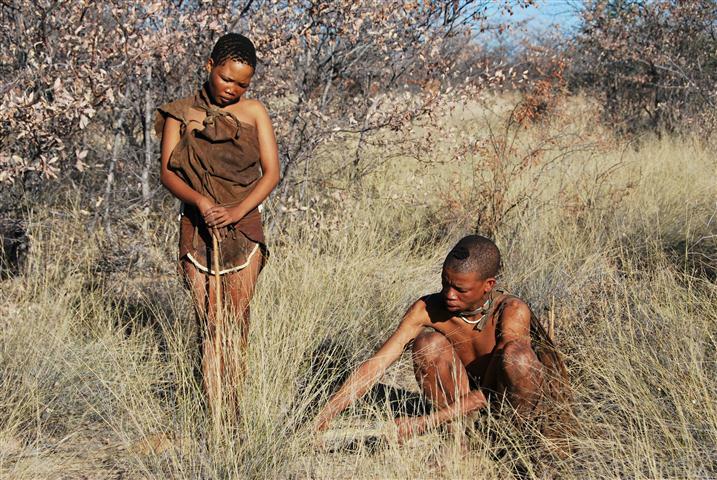 We arrived at our campground and the next morning met a small group of San people, the indigenous hunter-gatherers of southern Africa. Although they now work on a farm affiliated with the camp, they’ve retained some of their culture and during an hour long walk they showed us plants used as part of their traditional medicine. After the walk we piled back into the truck and drove another 300 kilometers northwest to the Okavango Delta, the world’s largest inland delta. We left the truck behind and loaded our gear into traditional dugout canoes for an overnight trip into the delta. 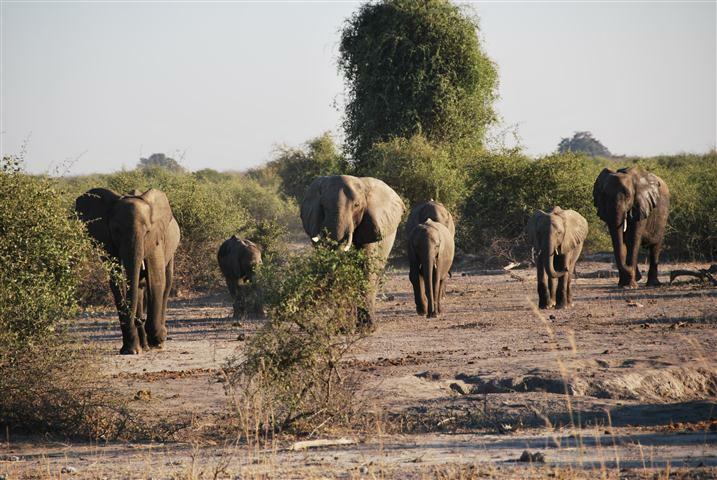 The Okavango Delta is home to a rich variety of wildlife, and although we saw only a few elephants and a herd of zebra our time in the delta probably took us further into the wilderness than anywhere else in Africa. Our guides used long poles to push their canoes, choosing a route through the shallows to preclude attacks by hippos submerged and hidden in deeper waters. 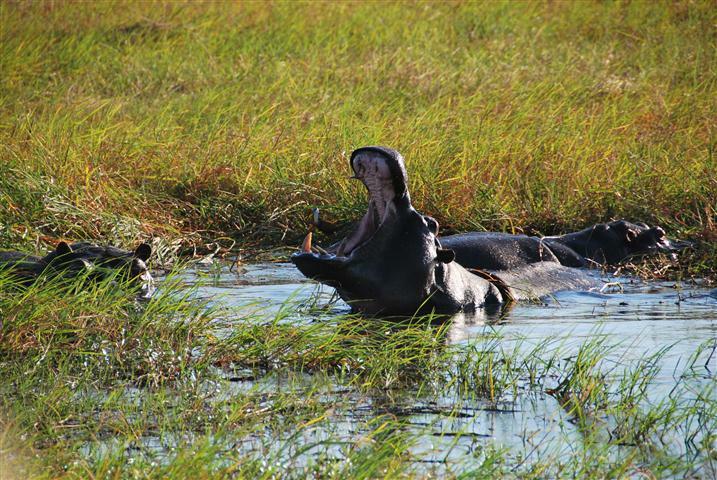 Hippos are herbivores, emerging from the water to eat grass at night, but are also one of the most dangerous animals in Africa and are known to attack without provocation. Our primitive island camp had no fences or boundaries, and there were no lights or vehicles to frighten the animals. Our guides were adamant that we not stray from the camp alone or leave our tents during the night. A group of three adventurers, including your fearless correspondent, ignored this advice and ventured from the campfire after hearing noises in the bush. We spent 30 minutes shining our headlamps in the direction of crashing tree branches and other unidentifiable noises before scurrying back to camp. We were probably hearing an elephant – during a guided walk the following morning we stepped around several massive piles of dung before coming across a lone bull. Another long day of driving brought us to Chobe National Park. The next morning we woke before sunrise and set out for our first game drive, wrapped in our sleeping bags to stay warm in the open air safari vehicle. Chobe is particularly known for its population of 120,000 elephants, and as the sky brightened their impact on the park was obvious. Well-worn paths crisscrossed the landscape, many of the trees were stripped of leaves, and some smaller vegetation was trampled. 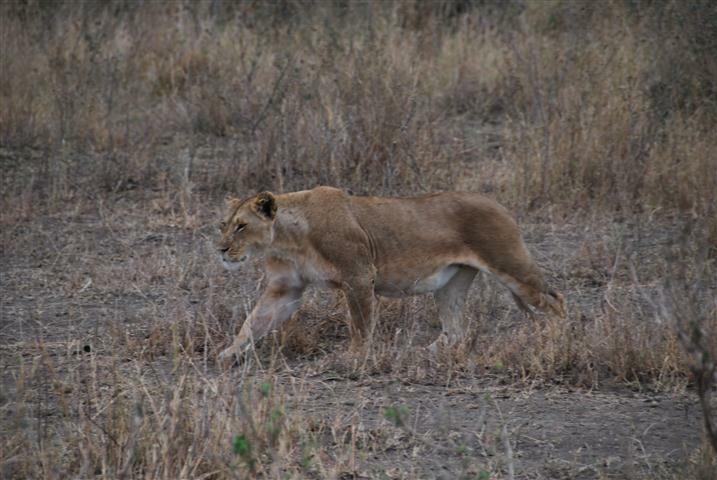 During the morning game drive we saw many elephants as well as gazelle, giraffes, baboons, warthogs, and hippos. 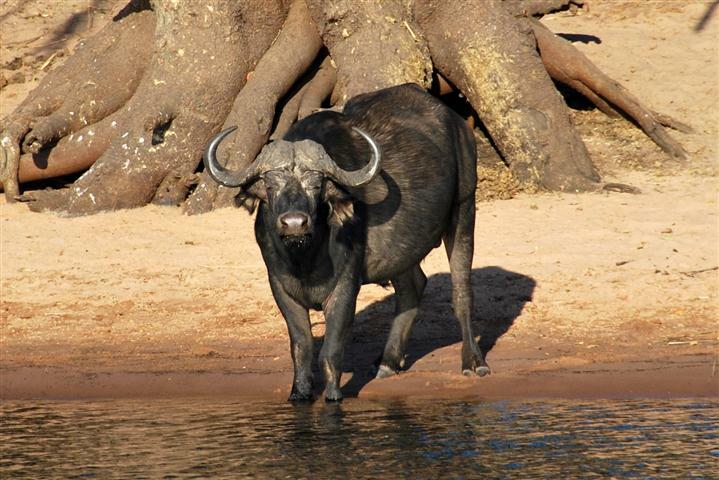 We spotted our first Cape buffalo, the fourth check mark on our list of Africa’s “Big Five”. Cape buffalo are ironically another of Africa’s most dangerous animals; for someone from The Dairy State the prospect of being charged and gored by a cow seems rather strange. The term Big Five was coined by white hunters and refers to the five most difficult animals to hunt in Africa. We’d seen elephants, rhinoceros, and lions in Namibia’s Etosha National Park. Only the leopard remained. After the game drive we returned to the camp for a few hours of rest, and then boarded a boat for game viewing from the Chobe River. We saw more of the same animals as in the morning, as well as crocodiles and many more hippos. The next morning we once again pried ourselves out of bed before sunrise, ate a quick breakfast, and climbed into the truck for the drive to the Zambia border. 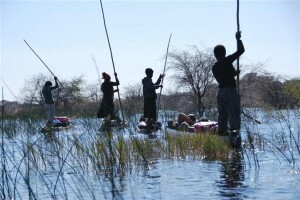 The Okavango Delta was the highlight of our six days in Botswana. 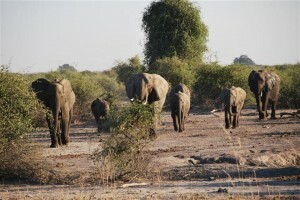 We didn’t see as many animals as in Etosha or Chobe, but the delta offered a wilder yet also more relaxing experience. 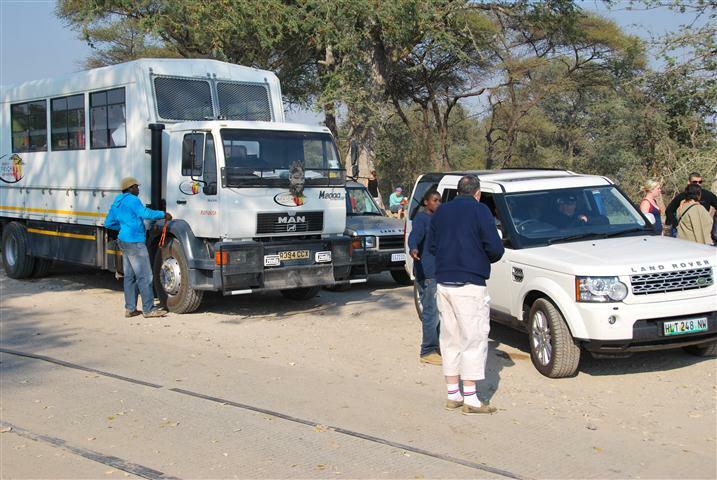 During our game drives we peered out from the relative safety of a safari truck and sometimes had to jostle with other vehicles for the best viewing position. In the Okavango we glided along inches above the water and slept with only a thin layer of canvas between ourselves and the wilderness. We were alone, and after our campfire died down and we’d retired to our tents, the only sounds were of the unseen beasts roaming the bush. On the second day of our overland tour we crossed the border into Namibia. 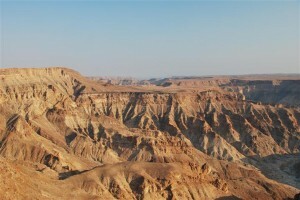 Our first stop was Fish River Canyon, the world’s second largest canyon after the Grand Canyon. The canyon is certainly beautiful but I don’t think we had adequate time to truly appreciate its grandeur. Jason and I could have spent a couple days exploring the area and hiking through the canyon’s interior but our group only had a few hours to walk along the rim. This was just the first of many places on our overland itinerary where we felt we had insufficient time. Granted, we signed up for the tour knowing this would be the case given the vast distances we planned to cover; approximately 3,000 miles in three weeks. Despite our desire to see more of the canyon we pushed on to Namib Naukluft Park, home of the world’s oldest desert and highest sand dunes. Like many of the park’s visitors, we rose early and climbed Dune 45 to watch the sunrise. Standing over 500 feet tall, the climb was strenuous but well worth it as we were rewarded with beautiful views of the surrounding area. 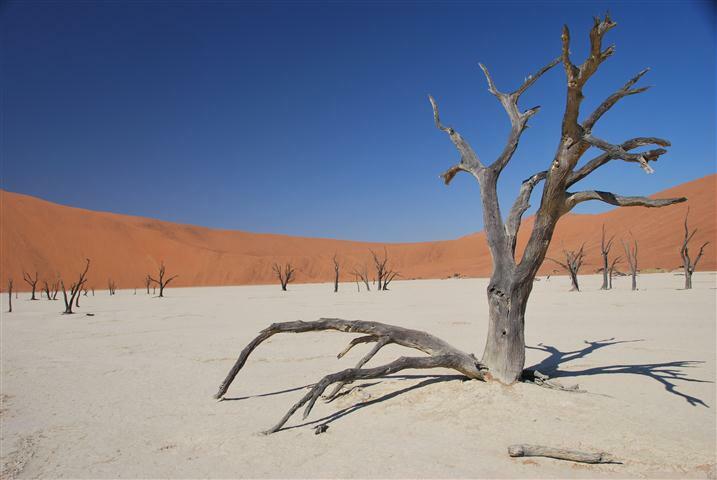 While in the park we also visited Dead Vlei, a dried lake bed in the middle of the desert. 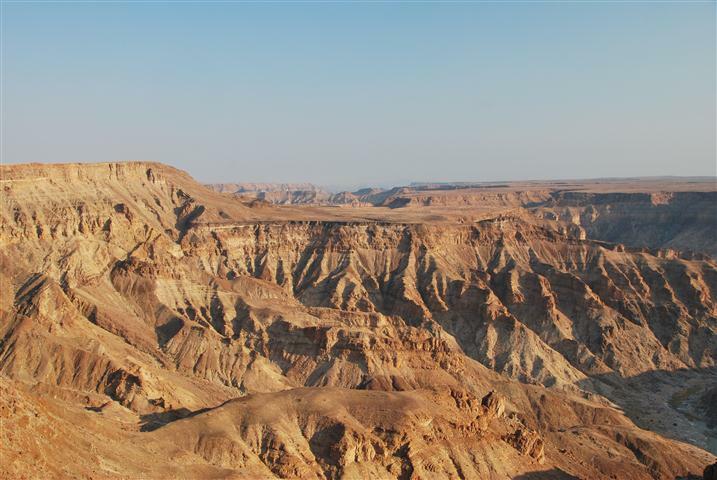 According to our guide it was cut off from the flow of the Tsauchab River approximately 500 years ago. Climbing to the top of a small sand dune Dead Vlei appeared unexpectedly before us. Stark white and peppered with ancient acacia trees, it contrasts sharply with the surrounding red dunes. 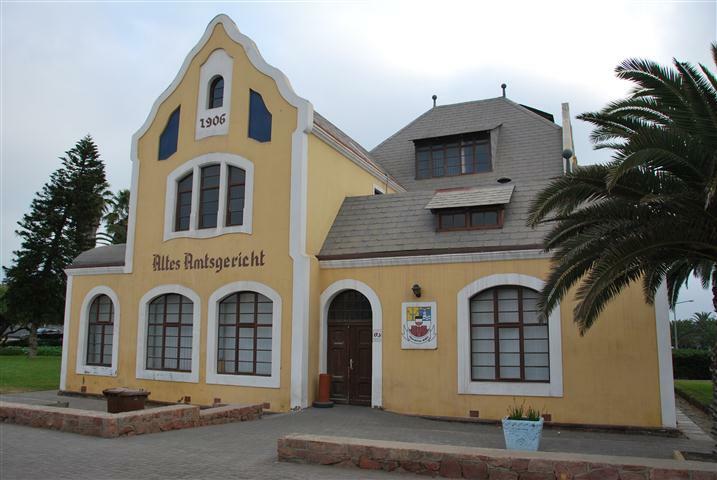 Leaving the desert and our camping equipment behind for a few days, we headed west to Swakopmund, a small town on the Atlantic coast. As we drove out of the Namib Desert, Swakopmund unfolded like a mirage in front of us. One minute we were surrounded by nothing but sand and the next we were driving down palm tree-lined streets filled with cafes and homes. 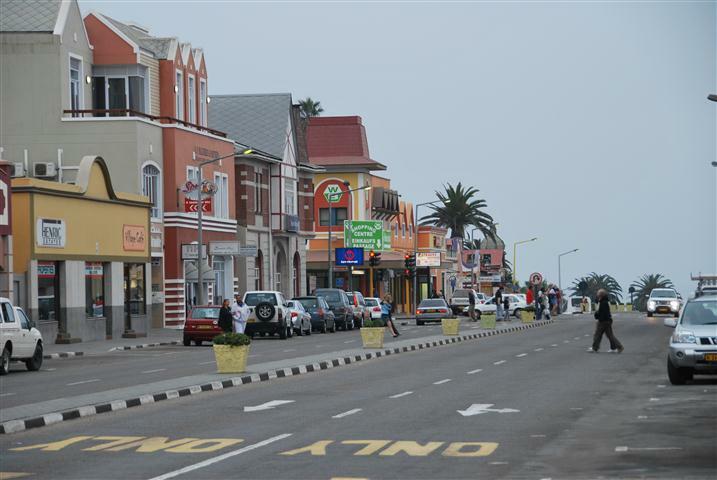 Swakopmund is dubbed Namibia’s adrenaline capital and many of our travel companions entertained themselves with activities such as quad biking, sky diving and deep sea fishing. In an attempt to maintain our budget, Jason and I found other ways to pass the time. After spending so many hours sitting on the truck, I especially enjoyed running along the beach promenade and wandering through the city’s historic area. Namibia was once a German colony known as German South-West Africa and this past is reflected in the city’s architecture. The historic buildings have been maintained and preserved so well that it was easy to forget we were in southern Africa and not Germany. 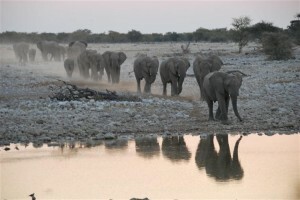 The highlight of our time in Namibia was a visit to Etosha National Park. 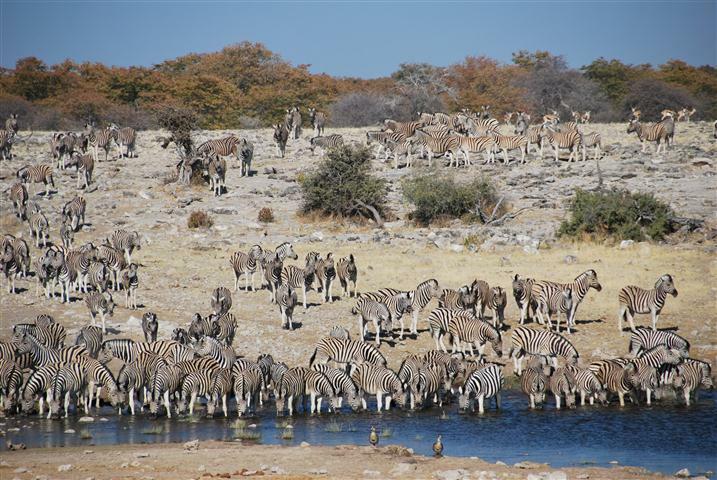 Etosha is one of Africa’s largest parks and is home to 114 mammal species and 340 different types of birds. 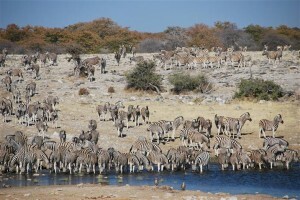 During the dry season, Etosha’s animals and birds are dependent on about 30 waterholes, some natural and others fed artificially from boreholes. These waterholes are accessible by road and are excellent places to observe wildlife. Our group spent two days driving through Etosha and saw large numbers of springbok, gemsbok, zebra, giraffes, rhinos and elephants. Many of these animals were spotted congregating around the waterholes. I was especially entertained by the large numbers of elephants drawing water up into their trunks and then shooting it into their mouths. 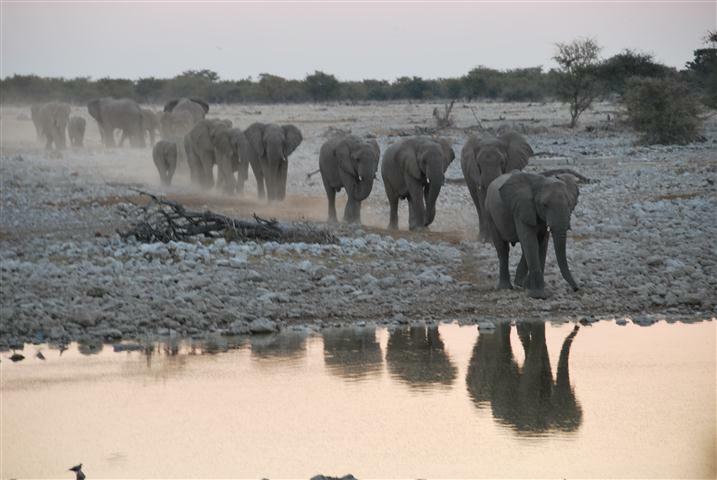 One of Etosha’s best features is its floodlit waterholes situated next to each of the park’s campgrounds. These waterholes are accessible 24 hours a day and campers can spend as much time as they want watching the animals as they come to drink. Both nights in Etosha we made it back to the campsite just before sunset and arrived at the waterhole in time to see a large herd of elephants on the horizon. Despite their size and numbers their approach was virtually silent. During our nine days in Namibia, we were blown away by the landscape and wildlife. Namibia is a vast desert yet interspersed amongst the emptiness are spectacular sand dunes, one of the world’s largest canyons, a modern town filled with German architecture and a national park teeming with incredible wildlife. I was initially disappointed that we spent very little time in Namibia interacting with the local people and learning about Namibian culture. Looking back though, I realize that I may not have learned a lot about Namibian culture but I did learn a lot about Africa. Most importantly I learned that there is no stereotypical Africa. Namibia in particular defies the stereotypes that many people have about Africa. Not only does it have the second-lowest population density of any country in the world but the infrastructure is good, roads are well-maintained and safe water flows directly out of the tap. Namibia set a high bar for the remainder of the countries on our African itinerary.